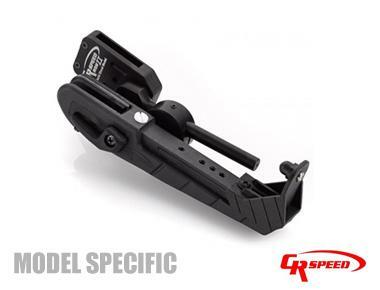 The World Shoot Model 2 is the latest version of the highly successful CR Speed Holster. It offers easier adjustment & precise positioning Thanks to our fully CNC Machined Versa-Hanger. CR Speed Holsters can be set up to fit most Popular Open, Limited or Production pistols. The Increased versatility CR Speed Holsters offer means you can get the perfect fit for your pistol. Superior Retention & Lightning Fast draws means security & performance above all else. It also features our new CR Speed Muzzle Platform as requested by many of our customers. WSM II Gun Specific Models feature a machine modified holster body suited to specific pistol models listed below. They are not universal fit. “Lockable with Pull-Through featureCompetition Proven, used by Current IPSC National & World Champions .
" G ”, Glock Small Frame Pistols. “ GL ” Glock Large Frame Pistols. “ XD ” Springfield XD Pistols. “ USP ” Heckler & Koch USP Pistols.